Rotisserie chicken and frozen puff pastry take chicken pot pie from Sunday supper to everyday meal. And the comfort food factor? Off the charts. You can take this recipe and make it into traditional pot pie, or even a turnover. Orrrrrr you can make these adorable little bite-sized appetizers. 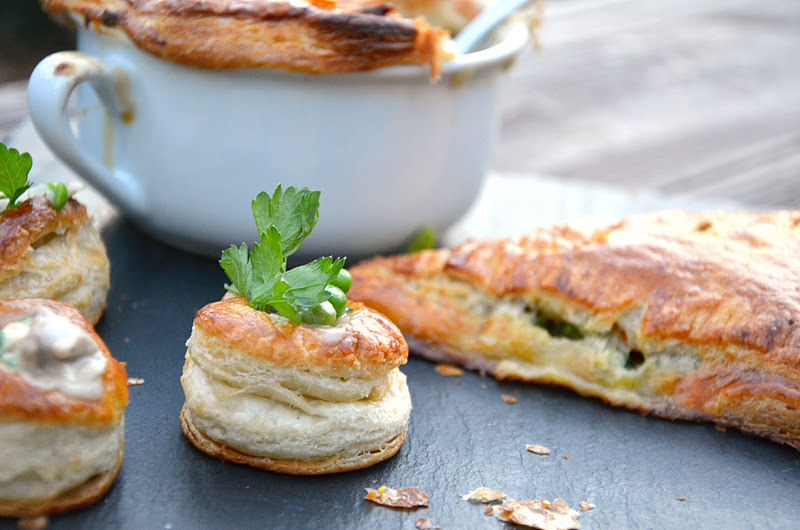 Chicken pot pie poppers. Once you pop, you can't stop. Heat 1 tablespoon olive oil in a large, heavy-bottomed pot over medium high heat. Add carrots, both onions, garlic, thyme, salt, and pepper. Sauté until carrots soften and onions are translucent, 5-8 minutes. Add the butter. Once melted, sprinkle in the flour and stir to combine. Keep stirring occasionally, cooking the flour 1-2 minutes. Gradually add the chicken stock while stirring, then the milk, continuously stirring until fully incorporated. Turn heat down and let simmer, stirring occasionally, until the sauce thickens, about 5 minutes. Add chicken, peas, and parsley to the filling, stirring to incorporate. For pot pies: ladle warm filling into an oven-safe ramekin or bowl (for individuals) or a casserole dish. Using your vessel(s) as a guide, cut your sheet of puff pastry to fit 1/2 inch wider than the rim. Pinch to seal, using egg wash on the underside of the overhanging edge to act as glue if needed. Cut a slit to vent and brush tops with egg wash and place on a baking sheet (if making individuals) and bake until tops are a dark golden brown, 15-20 minutes. For turnovers: cut one sheet of puff pastry into 4 squares, spoon 2-3 tablespoons of filling into the center of each. Brush the perimeter with egg wash. Fold one corner over to the opposite corner and use the tines of a fork to seal the edges. Cut a slit in the top of each to vent. Carefully place onto a baking sheet and bake until dark golden brown, about 12 minutes. For appetizers: use Pepperidge Farm puff pastry cups and bake according to instructions on box. Spoon in filling and garnish with small sprig of parsley. To make your own cups, lightly roll two sheets of puff pastry together and cut into small circles. Brush with egg wash and bake for 6-8 minutes, until the tops are brown. Let cool a minute or two, then use a sharp knife to cut a core out of each one. Fill and serve immediately. Tell you what. If I unhinge my jaw, would you toss about 17 of those pot pie poppers right into my pie hole? Perfect. I have been craving chicken pot pit. I love puff pastry...these are gorgeous! Carly, this look sooooo good! I'm a sucker for chicken pot pie too. your pics are stunning, Carly! Can I have a dozen of the pot pie bites for my afternoon snack please?! Mmm!! What what what? Pot pie poppers?? OMG!!!!!!! I need to make a million of these!! Love this idea! Pip poppin' fantastic ma'am! Totally borrowing it. You're a freakin' genius! I'm not sure which I want more...hmmm.... okay fine, I'll take them all! Loving this idea. So drooling right now. 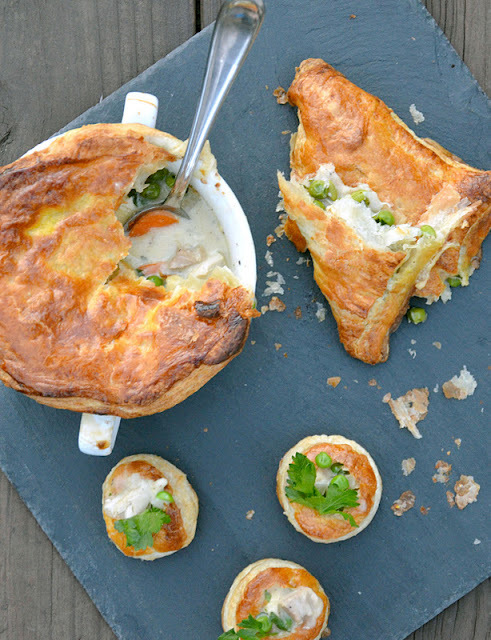 Those pot pie poppers may be the cutest thing I have seen in a long time. Love love love it! When do you add the chicken and peas? Good catch, UM - thank you! They're added to the mixture last - you'll see I've added the directions to step 6 above. If you require easy Appetizer Ideas for Party, get the Delicious Dessert Recipes, Easy Cake Recipes from Scratch only at madhurasrecipe.com. you post about to google adsense is really usfull, tanks for your post.